The iPhone 8 is still a good number of months away from being announced and all of the attention in the smartphone world right now is on what the Samsung Galaxy S8 will bring to the table much sooner than Apple’s next flagship device, but that is never going to stop people looking at the company from Cupertino and wondering what it will bestow upon us. There have been rumors galore, just as there always are, and while there have been no hardware parts leaked as yet, there is still plenty to get the teeth into. 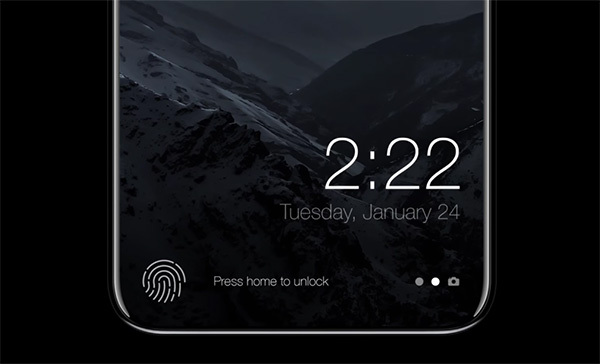 There is also much for the artistic types to use when creating their awesome concept videos and artwork as well, and graphic designer Moe Slah has taken some of the most prominent iPhone 8 rumors and used them in order to create one of the best, most interesting concepts for the iPhone 8 that we have seen yet. Slah also tried his hand at showcasing what Apple may do with iOS 11 as well, so this particular concept has double the hotness to check out. The theme running through this concept is the bezel-free screen and the on-screen Home button. Apple has been rumored to have plans for a new iPhone that is effectively sans-bezels, with the screen filling the vast majority of the device’s front panel. For that to happen, the Home button and, of course, the Touch ID sensor have to be moved to within, or under the screen. This concept allows for that, and highlights what such a move could allow iOS to do when provided with more screen real estate with which to work. Just as with all good concepts, this one has a video to drool over and that’s exactly what we suggest you do. Concepts are about images, not words, so sit back and relax. You’re in for a doozy here. Don’t care about the concept but bezel-less is my only hope.